I'm going to squeeze in one more chocolate treat recipe for you. Made with whipped egg whites and sugar, meringues are much lower in fat than the average Christmas cookie or candy. This particular recipe is flavored with cocoa powder and chocolate chips and the chocolate flavor certainly shines through. These aren't overly sweet, making them a nice change. And, as an added bonus, they are naturally gluten-free. My husband and I both enjoyed these crispy little cookies. I know they'll become a regular holiday treat in our house. Preheat the oven to 275°F. Line two baking sheets with parchment paper. Place egg whites in a grease-free mixing bowl and beat at medium speed with an electric mixer until frothy. Add the cream of tartar and salt, raise the speed to high, and beat until soft peaks form. Add sugar, 1 Tablespoon at a time, and continue to beat until stiff peaks form and meringue is glossy. Beat in cocoa and vanilla. Gently fold in chocolate chips. Scoop meringue into either a pastry bag fitted with a large star tip, or into a ziploc bag with the corner cut off. Pipe the meringue through bag of choice by heaping 1-Tablespoon portions onto prepared baking sheets. Bake for 30 minutes. 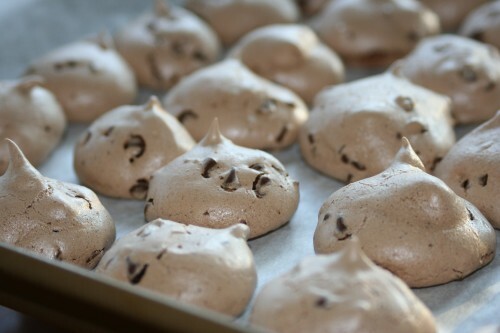 Turn off the oven, and allow meringues to stay in the oven for an additional 30 minutes. Transfer to a cooling rack to cool completely. Makes 3 to 4 dozen depending on size.